New to CrossFit, fitness, or the area? Check out our Free Saturday Class at 10 am. Everyone is welcome to come in and try out a class. Never been in a CrossFit Box or even a typical gym? Seasoned athlete or CrossFitter new to the area? Active but looking for a change or to add weight training to your current activity? 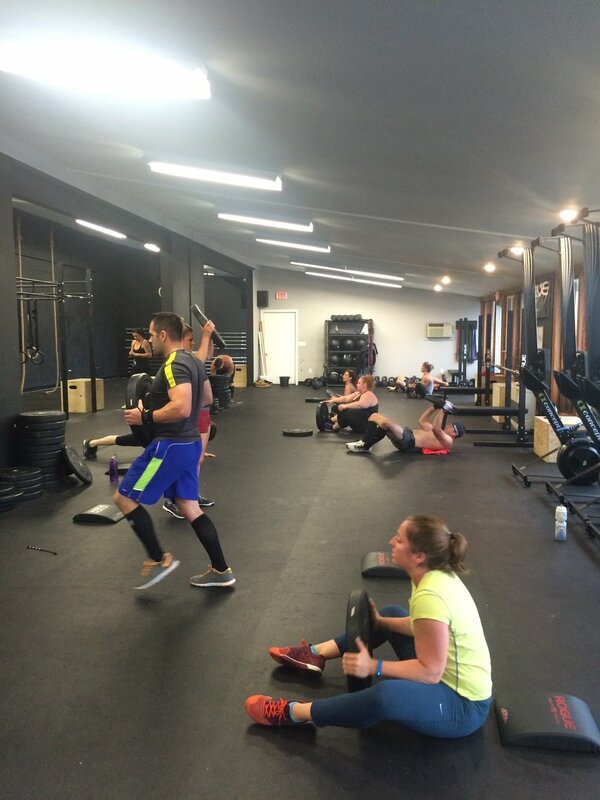 This is a great time to check out our space, meet current members, and get a taste of CrossFit at CFRT. Our Saturday WOD(workout of the day) is at 10 am. You will get paired up with a member and taken through a great workout to kick off the weekend! why should i pay for crossfit? Our health is invaluable! The cost of frequent doctors visits, prescription medication, and other medical expenses associated with being unhealthy or out of shape can add up quickly. Local gyms range from $30-$60 for a monthly membership and may have start-up fees. That membership gives you access to equipment, mirrors, and possibly some classes. Does that keep you motivated and allow you to achieve your goals? Maybe a personal trainer can help you achieve your goals and keep you motivated? Local personal training starts around $45 per hour and go up from there. 1 hour with a personal trainer per week plus a membership will cost over $200. Every time you workout at CrossFit Rising Tide you will have a coach to guide you through a warm up, mobility, weightlifting, and metcons! Our program is designed to be progressive so you will see results as time goes by and feel comfortable that plenty of thought and knowledge was put into your plan. You will also get the support of a great community in every session to help push your abilities to places you may not have thought possible or are able to achieve on your own. Everyone at CrossFit Rising Tide begins with a course we call On-Ramp. This consists of 5 sessions that can be done in a small group or scheduled as private 1-on-1 sessions. This course will take all new members through the major movements of CrossFit, starting with the basics to address weaknesses and build a solid base with air squats, strict presses, and deadlifts. The course builds through movements to finish with a session devoted to learning the basics of olympic weightlifting. Experienced athletes and members who have never touched a barbell will all take away plenty of information and finish on-ramp ready to jump into our daily CrossFit sessions. On-Ramps are typically scheduled 6am-7am, 8:15 am-9:15am, or 6:45pm-7:45pm, over 2 weeks. We can schedule on-ramps at other times for an added fee. Check out our Facebook and Instagram for On-Ramp promotions and discounts. -CrossFit Rising Tide * Required field!